Located on the first floor overlooking the wonderful beachfront of Byron Main Beach this beautifully renovated four bedroom apartment is modern and stylish offering a light and airy oasis of calm. 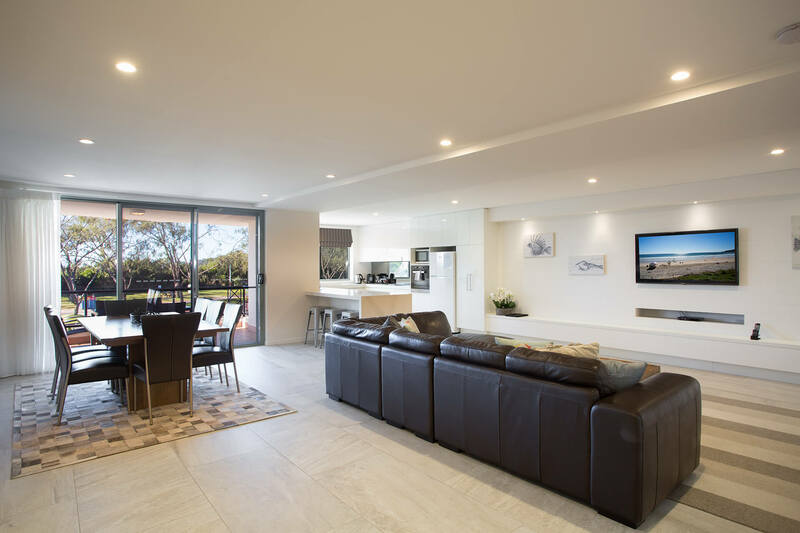 With a comfortable and modern décor, Apartment 9 features a spacious lounge and dining area with a fully equipped kitchen, opening onto a large balcony overlooking the dunes and the beachfront. The large king sized master bedroom has an ensuite while the second bedroom has another king size bed and the two additional rooms feature queen beds. A family bathroom and full laundry facilities complete this wonderful apartment. Free wifi is included. With a perfect beachfront location, Bay Royal Apartments features a full sized flood lit tennis court, a swimming pool and comfortable BBQ area. Our beachfront position means you can literally walk straight across the road and be on the patrolled Main Beach of Byron and a short stroll will find you in the heart of Byron’s exciting township.